It’s the last thing you grab when you’re walking out of the house, yet it’s the most important piece of your outfit. More than just an accessory, handbags carry our wallets, phones & the essentials that keep us going all day. 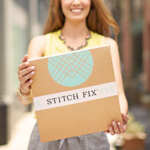 From cult-favorite beauty must-haves to baby products—three Stitch Fix employees tell us what they tote around every day. See what 3 of our fabulous power-ladies can’t live without! Sophisticated with a whimsical flare, Cristina has a penchant for ladylike scents and simple accouterments. Here’s what our VP of Brand & Creative carries on the daily. Classic and casual, new mom Amanda never leaves the house unprepared. Whether it’s a last-minute meeting or the baby’s teething, see what our Director of Merchandise Operations can’t go without. Fashion-forward, Margo is known around the hallways for her contagious laugh and aspirational style. See what our Chief People & Culture Office stows in her satchel. What can YOU not live without? Let us know in the comments!